The Bear Hotel01873 810408work HotelThe Bear Hotel, Crickhowell is famous far and wide for its welcoming atmosphere, historic character, convivial surroundings and good food. A cobbled forecourt, archway into the inner courtyard and 19th-century stagecoach timetable in the bar are all reminders of the Bear's former role. Set in the heart of The Brecon Beacons National Park you'll find some of the finest walks in Britain with the Beacons themselves and The Black Mountains right on the doorstep. It feels like another world but just an hours drive from Bristol and less than an hour from Cardiff. The Bear's low-beamed bar, filled with antiques and warmed by a roaring log fire in winter, has twice won the Best Pub in Britain' award. It sets the style for a place to stay which is warm and characterful rather than a hotel in the grand manner. You'll be looked after by friendly hosts Judith and Steve Hindmarsh, who are also proud of the Bear's reputation for serving interesting, freshly cooked food (which has won recognition in Britain and the USA). The Bear Hotel, Crickhowell is famous far and wide for its welcoming atmosphere, historic character, convivial surroundings and good food. A cobbled forecourt, archway into the inner courtyard and 19th-century stagecoach timetable in the bar are all reminders of the Bear's former role. This 15th century historic coaching inn dates back to 1432 and tastefully incorporates all modern comforts into its historic surroundings. Rooms within the hotel are individually furnished and offer a range of accommodation including four poster beds and jacuzzi baths. 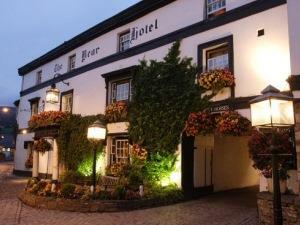 Popular with locals and visitors alike, the Bear is the social hub of the pretty little town of Crickhowell.